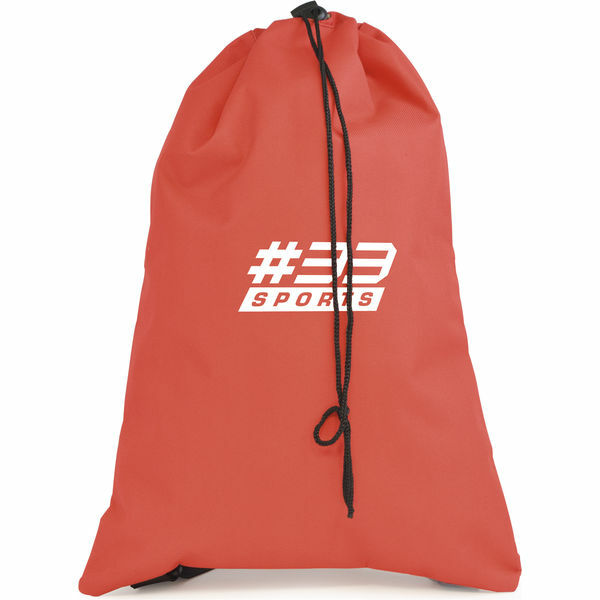 Here at EpicOrange we are pleased to be able to offer an exception range of high quality Drawstring Bags. 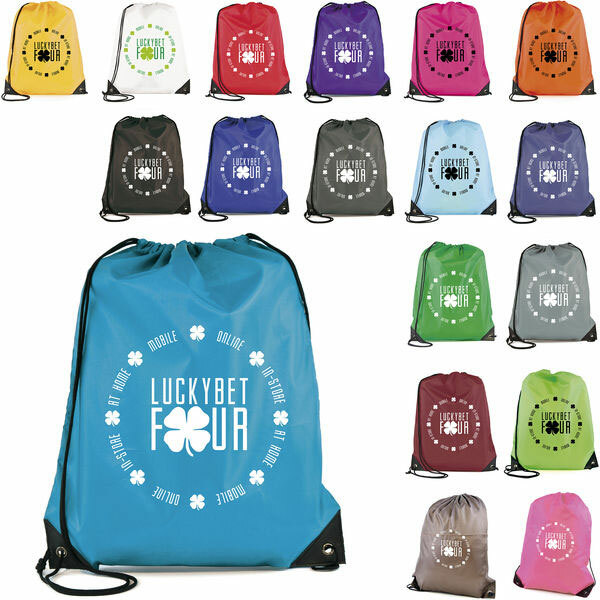 Each of our Drawstring Bags is hand picked to provide exceptional value and wide range of choice. With bags available with 1 colour printing from just 50 units, to bags with Full Colour printing options and a choice of Reflective Drawstring bags to enhance road safety. All available for fast delivery! 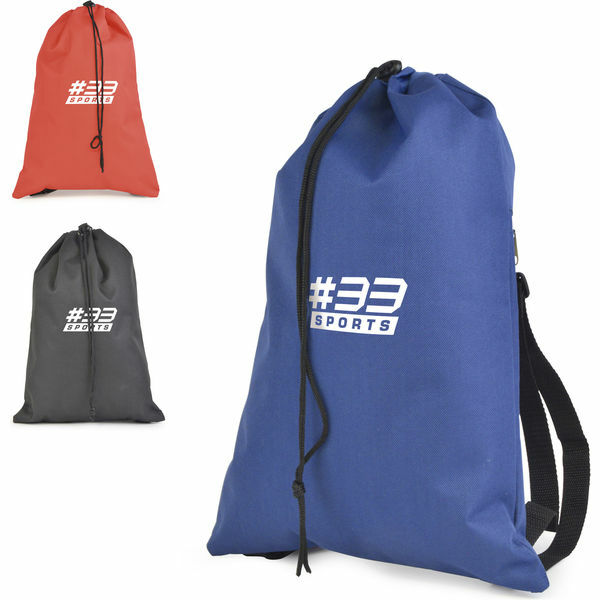 The Rothy is our budget drawstring bag, made from Recyclable 80gsm non-woven polypropylene. Featuring matching coloured drawstring in a range of vibrant colours. Ideal for schools and charity promotions. Available from just 50 units in 5-7 working days! From £0.88 each (2500 units with 1 colour print). Large 225mm x 225mm print area. Size: 305mm x 427mm high. 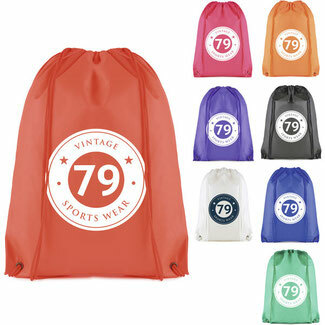 The Pegasus is our best selling drawstring bag, made from quality 210D polyester. Features Black PU re-enforced corners and Black drawstring. Available in a wide range of colours! Ideal for schools, clubs, colleges and universities. Size: 330mm x 435mm high. 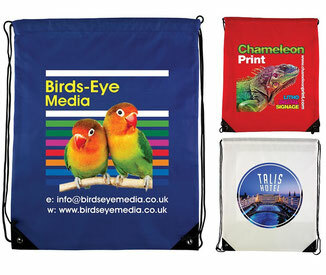 The Verve is made from 210D polyester, specifically chosen to deliver exceptional Full Colour Printing at value prices. Features Black PU re-enforced corners and Black drawstring. Available from just 100 units in 5-7 working days! Large 380mm x 485mm print area. Size: 300mm x 365mm high. 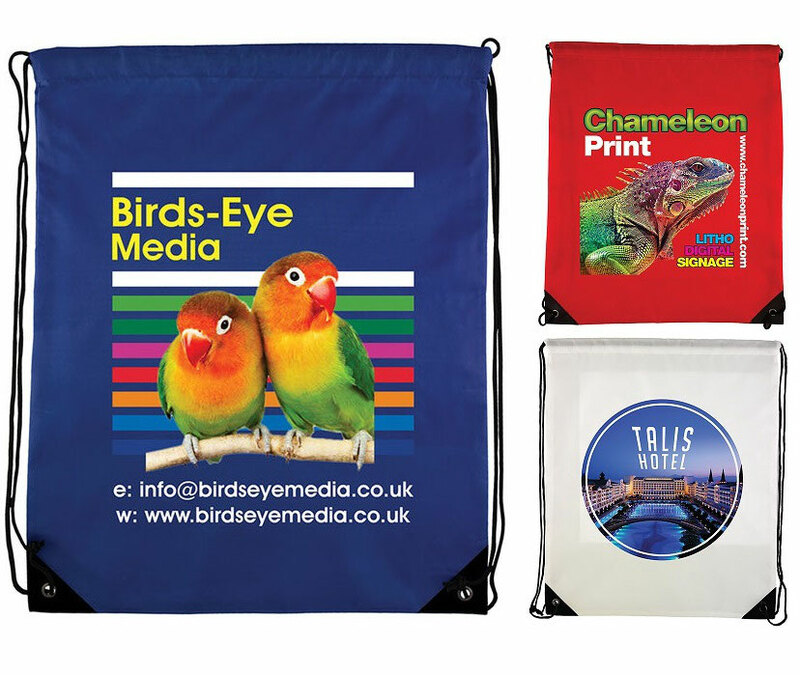 Our Full Colour 'Dye Sub' Drawstring bags have an amazing all over CMYK print area allowing maximum exposure for your design/branding. They come as standard with a selection of rope handle colours, black leatherette re-enforced corners & metal eyelets. Available from just 100 units, 5 week lead time. Large 330mm x 450mm print area. Size: 330mm x 450mm high. 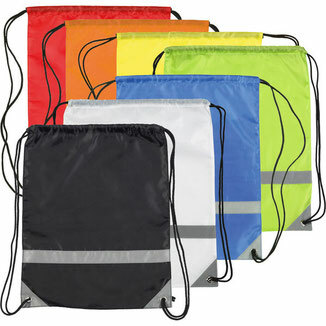 These Knockholt reflective drawstring bags are manufactured from REACH compliant 210D (nylon look) polyester. This bag features a PU backing providing superb water resistance characteristics. High quality reflective band and reflective re-enforced corners provide a high level of road safety. Available from just 50 units in 10 working days! Large 150mm x 210mm print area. Size: 345mm x 445mm high. Our Epic Reflective drawstring bags provide super high visibility along with extra function and huge branding potential. 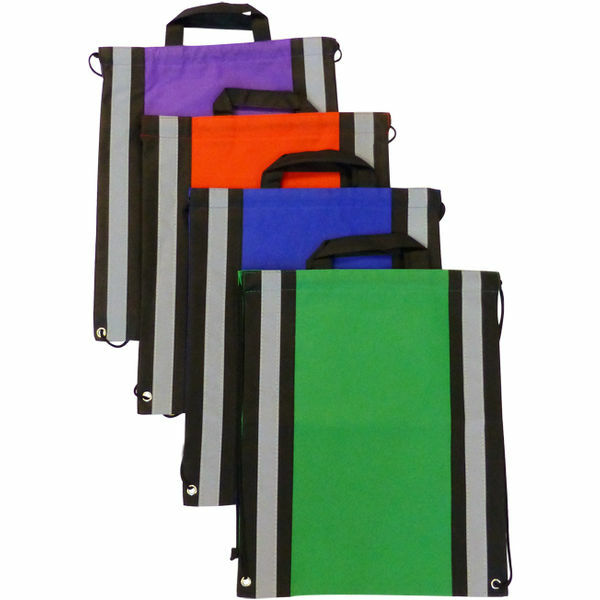 The bags feature high quality reflective bands down both sides, providing rear and side visibility. Also featuring a strong top grab handle for easy hand carry and Black drawstring for shoulder carry. 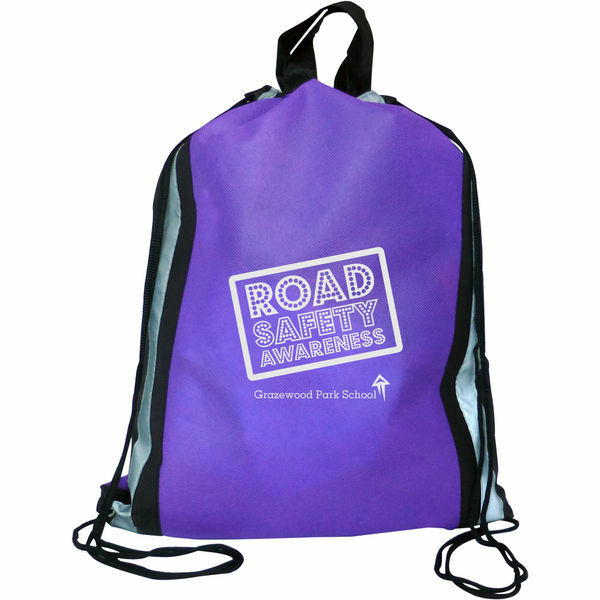 These bags are perfect for road safety campaigns, schools, children's centers or clubs. Large 170mm x 250mm print area. Size: 340mm x 430mm high. 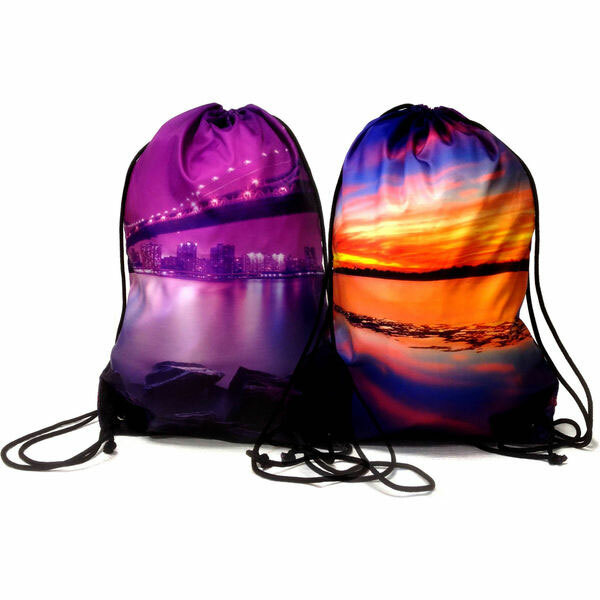 Not just your average drawstring bags! 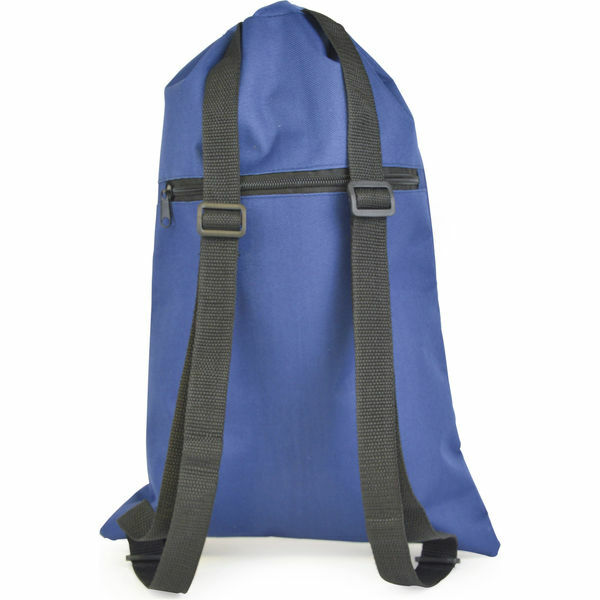 The Lucas is a drawstring rucksack, made with heavyweight 600D polyester. Featuring a large zipped pocket to the rear, plus strong, adjustable shoulder straps. 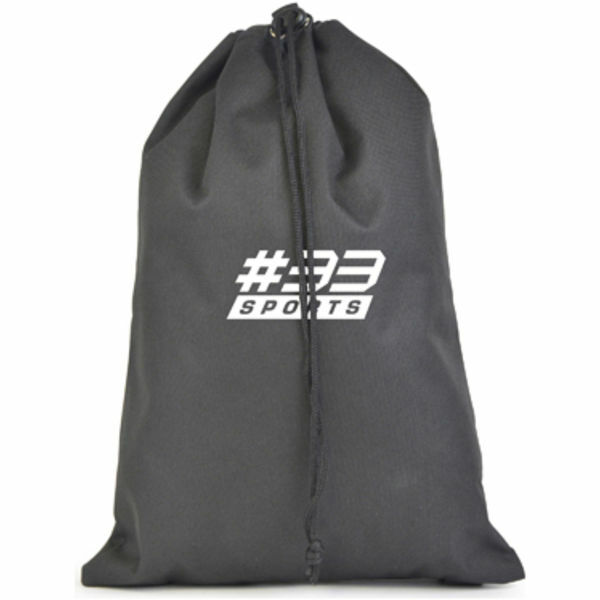 The Black drawstring closure keeps items safe inside. Large 200mm x 200mm print area. Size: 300mm x 445mm high.